All is right in the Vail Valley on Monday morning, March 7. It’s finally snowing again after the powder gods took a month off and gave way to the gods of sunshine and spring skiing in February. The powder gods are now back … and let’s hope they stick around for a while. 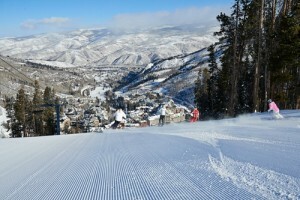 Beaver Creek saw several inches of fresh powder on Monday, March 7 (Vail Resorts photo). But besides some fresh snow on top of the still very respectable base of snow that piled up in December and January, the Vail Valley is also celebrating yet another successful Burton US Open snowboarding championship, with 29-year-old, two-time Olympic gold medalist Shaun White returning to Vail to take home top honors in the superpipe on Saturday. White went a long way toward burying all those pesky retirement rumors. Monday is a bittersweet day for Vail Valley Broncos fans. A place that actually produced a Bronco — Battle Mountain High School star Jeff Campbell — and can boast a restaurant named after the team’s most famous executive, John Elway, watched as Peyton Manning officially called it quits, going out on top after bringing another Super Bowl trophy home to Colorado. I wonder now if Eagle-Vail’s own Mikaela Shiffrin, a remarkable ski racer who late last year told me she was both a New England Patriots fan and a Broncos fan, now leans a little more toward Denver. She spent her youth in both New England and the Colorado Rockies, so her split personality is understandable. The most important thing, though, is Shiffrin is very single-minded about where she stands on winning, which she did in astounding fashion on Sunday, continuing her streak of nine straight World Cup slalom wins despite taking two months off to recover from a mid-season knee injury. On Monday, Shiffrin finished 14th in a giant slalom, scoring some more World Cup points and climbing back toward the top 10 in the overall standings — an incredible accomplishment given those couple of months off. Unfortunately, Switzerland’s Lara Gut passed Vail’s Lindsey Vonn for the overall lead with her fourth-place finish on Monday. Vonn is done for the season after a knee injury last weekend and won’t claim her fifth career overall title. Shiffrin won’t be able to defend her season slalom title, as she came back too late to accumulate enough points. But clearly she is the best slalom skier on the planet and poised to become a real overall title threat next season. Vonn also promised that she’ll be back for the World Championships next season and the Olympics in 2018 (where maybe she’ll retire on top Peyton Manning-style with yet another Olympic downhill medal). Meanwhile, look for a strong finish to the ski season here in the Vail Valley, where meteorologist Joel Gratz of Opensnow.com says the weather pattern is hopefully finally shifting for the final month-plus of the ski season. JASNA, Slovakia (March 7, 2016) – A day after winning the slalom by over two seconds, Mikaela Shiffrin (Eagle-Vail, CO) took 14th in the Audi FIS Ski World Cup giant slalom in Jasna, Slovakia. Rescheduled from Saturday’s canceled GS, the weather lacked the amount of fog, snow and wind to which the racers were becoming accustomed in Jasna. But even with the bad weather throughout the weekend, the long course was in perfect condition with the racers able to grip it and rip it. In the attack for the GS globe, Austrian Eva-Maria Brem pulled off a victory with Viktoria Rebensburg of Germany attacking from 12th place first run to take second. Federica Brignone of Italy was third. Resi Stiegler (Jackson, WY) and Megan McJames (Park City, UT) also started the Jasna giant slalom, but did not qualify for a second run. It was Stiegler’s first World Cup GS since 2013. Mikaela Shiffrin finished 14th in the Jasna giant slalom. It was only Shiffrin’s second GS finish this season, having taken second in Soelden in October. It was Shiffrin’s fifth race back on the World Cup tour after injuring her knee. Eva-Maria Brem sits in first for the GS World Cup title with 442 points, with Viktoria Rebensburg hot on her heels with 410 points. Lara Gut is also still in the hunt with 362 points. Next up, the women race super G and combined in Lenzerheide, Switzerland next weekend before World Cup Finals kick off March 15. I haven’t had a lot of time on my GS skis. I don’t feel comfortable with my timing at all. I don’t feel comfortable getting [my skis] out from under me and trusting them to come back. Some of my training days have been really good. My first time back in GS gates since the injury, I was like ‘Yes! This is easier than my slalom was!’ I know it’s there, but it’s been a struggle the past two weeks. I had two or three days of GS training. [Jasna] was really tough GS training—pretty soft snow and tough visibility. Not the type of place you want to find your timing. I was so excited to ski this race because the hill is great and was in great condition. My free skiing has felt really good, so I figured, what the heck, let’s see what happens. In order for me to really put my best skiing out there right now, everything has to set up perfectly. I’d rather be the kind of skier that can do it whenever. My goals changed after I got injured this season. I knew that I couldn’t come back for the slalom globe. I didn’t have a chance for the GS globe and definitely no chance for the overall. I figured the saving grace of the season would be to get some experience in the last two super Gs, try to get as many World Cup points as I can and see what I can do with the rest of the slaloms and GSs. Today was more disappointing than obviously yesterday was, but I didn’t want to come back and just race two races the rest of the season. I wanted to come back and actually ski and try to savor something from the season.